Two Bulgarian citizens were arrested in Edirne, the Turkish-Bulgarian border town, for smuggling alcoholic beverages and cigarettes wrapped around their bodies with packaging tape. 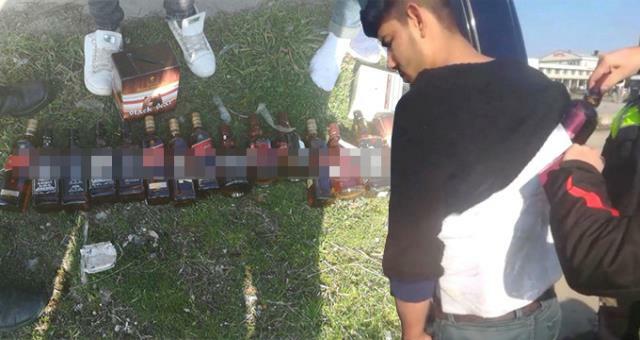 16 bottles of various alcoholic beverages and cigarettes wrapped around the bodies of the smugglers were seized by the local police, and the men were taken into custody. The ruling Justice and Development Party (AKP) came to power has been driving Turkish citizens to alternative ways to buy their favourite drink. Since Recep Tayyip Erdoğan came to power, the price of a Turkish favourite, raki, have jumped more than 8 times. Beer prices, according to data from the Turkish Statistics Institute (TUIK) increased by 770 percent. Turkish government currently levies some of the world’s highest taxes on alcohol and tobacco, which analysts say has encouraged increased both smuggling and illegal production. The surging taxes encouraged Turks to produce their own drinks at home. The Turkish government in December 2017, took steps to make homemade alcohol undrinkable. On Friday, it was reported that the import of distilled alcohol used in the production of home-made alcoholic drinks would be licenced. Producers are now required to add denatonium benzoate, a bitter chemical used as a repellent on ethyl alcohol bottles and write “not suitable for consumption,” on the bottles. Edirne'de iki Bulgar vatandaşının sınır kapısından geçerken yapılan üst aramasında vücutlarına sarılmış halde kaçak içki ve sigara bulundu.